So far I have been considering rhetorical and writerly properties of texts that could plausibly be considered exemplary for art history: they may appear experimental, but in their different ways they answer shared preoccupations of the discipline. Another way to consider what counts as experimental in relation to any discipline is to look at texts and practices that are read as outliers: they also appear experimental, but in ways that don't respond to the discipline's central concerns. In choosing Benjamin Binstock’s Vermeer's Family Secrets I don’t mean to nominate it as an exemplary outsider to art history’s practices as it understood itself in the first decade of this century. Rather I choose it because the text reveals, by contrast, a kind of rhetorical uniformity in the discipline. In the last several decades, especially since the dissemination of what I like to call the North Atlantic mode of art historical writing (the subject of a separate book project), art historical writing has become increasingly uniform, and that uniformity has become decreasingly visible, because the discipline tends to measure its diversity by looking at interpretive methodologies, theories, and the choices of subject matter. A book like Binstock’s, which is anything but rhetorically uniform, brings out that uniformity in a particularly clear way. The original occasion of these remarks was a conference on Vermeer’s Family Secrets held at NYU in 2013. Speakers at the conference included art historians (Martha Hollander, an expert in 17th c. Dutch painting, and one of the book’s original readers), historians (Ivan Gaskell), painters (Chuck Close, Vince Desiderio), and “generalists” (the philosopher Jonathan Gilmore, and the historian Anthony Grafton); there were about 12 in all. The conference marked the end of Lawrence Weschler’s tenure as director of the New York Institute for the Humanities, and it bookended a conference on David Hockney’s optical theories that Weschler had organized when he took up the position 11 years earlier. The two subjects were similar in Weschler’s view, because both books challenged something about the status quo of art history. Both were about “marginal” claims, ignored or rejected by the discipline. In the course of the conference, several scholars were mentioned who had decided not to attend, because they felt Binstock’s work was unimportant, misguided, or otherwise not worth their time. 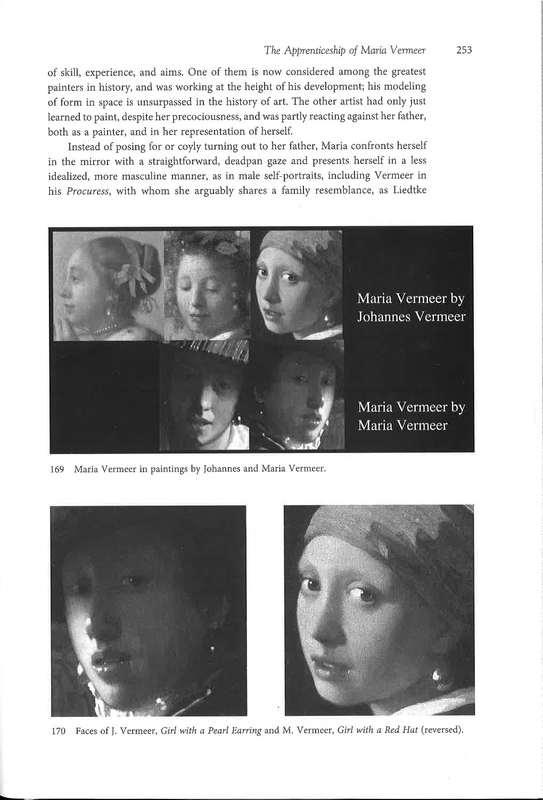 Vermeer’s Family Secrets is centrally concerned with Binstock’s claim that Vermeer’s daughter Maria painted several of his paintings, but that itself wasn’t the only impetus for the conference: Weschler was also interested in the fact that the book had barely been reviewed. 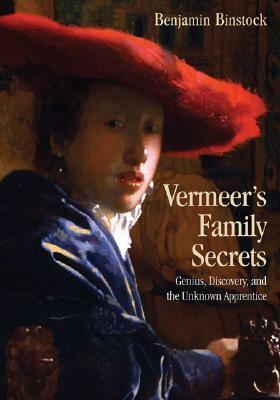 Vermeer’s Family Secrets is encyclopedic, and it seemed to be a work that would attract wide notice. It hadn’t, and Weschler wanted to use the book as a case study to explore disciplinary boundaries. He proposed the book as a good example of how “the academy” “processes” “renegade” scholarship. (Cobbling together words he used on different occasions to describe the conference.) I took issue with that purpose because I didn't think “the academy” was a useful notion in that context, and also because it wasn't clear to me how the book probably could stand for the many ways that disciplinary art history watches its borders. My sense is that Benjamin Binstock is perceived as an eccentric person with an unusual, perhaps old-fashioned, and definitely idiosyncratic research agenda that may not fit in with other scholars’ interests. But that does not mean his writing can be usefully taken as an example of what the discipline rejects, and on the other hand, there are ways to argue that his work is exemplary in relation to several of the discipline's own criteria. Before I list some of the salient traits of the book it may be helpful to consider its models—where it might be placed in the lineages of art historical writing. There is an encyclopedic tendency in Binstock’s work, which is uncommon in art history but comes, I think, directly from his emulation of his principal model, Leo Steinberg. 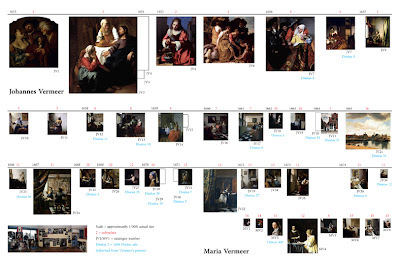 The Vermeer book ends with 95 theses; at the NYU conference I noted that many are multiple, and there are also many claims in the text that are not in the theses, so the book actually proposes hundreds of new claims. That is in striking contrast to recent monographs in the field, which sometimes elaborate just a few theses. (The fact that there is a list of 95 theses is a quirky reference to Martin Luther: if it means anything, it has to imply that Vermeer’s Family Secrets is like the founding document of the Protestant movement in that it's “a Reformation in Vermeer studies”: an analogy so overblown that it’s either endearing or irritating.) The closest parallel I know to the encyclopedic density of claims in Vermeer's Family Secrets is Steinberg's Leonardo's Incessant Last Supper. Steinberg is, I think, a pervasive and partly unassimilated influence in Binstock's writing. Some passages are immediately reminiscent of Steinberg, especially when Binstock argues using tightly written sentences, or brings in a wide range of kinds of evidence. The introduction of the painting The Little Street is like that: it collages cartography, archival documents, biography, and architectural history, and it includes the identification of the little girl as Vermeer’s daughter Maria. Steinberg might also come to mind when Binstock succinctly dispatches people he doesn’t agree with using or two carefully chosen quotations. (This happens to Svetlana Alpers, David Hockney, Philip Steadman, Daniel Arasse, and Linda Nochlin, all in the first chapter.) And Steinberg’s sense of art history is certainly alive in passages where Binstock talks about how art history shouldn’t be “ostrich art history” (p. 97), but should pay attention to what’s actually there, visible, on the canvas. Other passages are close to Harold Bloom, especially when the book turns, as it often does, on what Binstock calls “genius,” and when he invokes Bloom as the author of the “brilliant defense of genius” against the “school of resentment” (p. 361 n. 5). 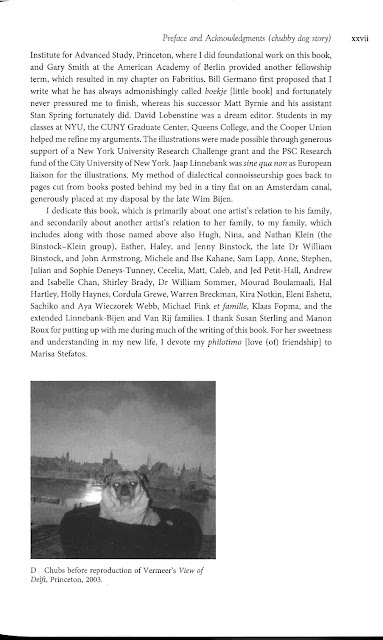 But Binstock is at his most Bloomian when he assays large-scale comparisons of artists, for example a triple parallel between Rembrandt, Fabritius, and Vermeer, and Bach, Mozart, and Beethoven (p. 86), or a comparison of Vermeer’s relation to Fabritius with Shakespeare’s relation to Marlowe (p. 89). 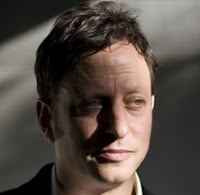 Steinberg and Bloom are the book’s two most visible influences. Others are named, but the traces of their writing aren’t legible in the text. Of those, Joseph Koerner is perhaps the most prominent. In addition to its named models, the book also descends in a more general way from several strains of art history that preceded modern and postmodern practices. The book has affinities with antiquarian studies, with connoisseurship, with and with what is sometimes called “positivist” art history, meaning whatever has to do with verifiable factual claims. In various passages the book also draws on conservation studies, provenance, legal documentation, church records, and art markets. All of these are presented crisply: they're stylistically dry, as facts tend to be, and they are all peripheral to the current concerns of the discipline. Binstock writes, for example, about the sequence of paintings in Rembrandt’s early career (the subject of his work in progress, as of 2013) and the attribution of paintings to Vermeer, his daughter Maria, or Carel Fabritius. A fair percentage of Vermeer’s Family Secrets is about sorting paintings according to when they were painted, who painted them, and who is represented in them. These points are not positivist in the usual understanding, because they aren't simply self-evident information to be gathered, but rather contentious points of interpretation. They are mingled, in the book, with observations that are more conventionally positivist such as mistaken dates, incorrect addresses, and information about people who commissioned and collected the paintings. If a reader were to try to reconstruct the history of art history using Vermeer’s Family Secrets, it would appear as a small constellation of recent and contemporary art historians and others (Steinberg, Bloom, Koerner), together with a set of concerns that would appear to a plurality of contemporary art historians as parts of the discipline’s past: attribution, identification, provenance, biography, archival documentation. Binstock is much more attached to verifiable or arguable facts than many art historians, and that is probably the immediate reason the book was not more widely reviewed or generously received by the discipline. (In part the silence of the discipline may be a result of reducing his interests to positivist claims. Reading a draft of this text, Binstock wrote that “my method is precisely about the relation between fundamental questions such as the order of the paintings, who painted them, who is depicted, and deeper psychological content or meaning, including Vermeer’s original contributions to what art can be.”) But I think there is a deeper reason, and that is also my own interest in this context. If I read the book as writing, I am going more strongly against the grain than if I read, say, Tim Clark's Sight of Death as writing, because the allegiance to verifiable or arguable truths is crucial to the way Binstock's book presents itself. That alone is an interesting indication of the partial openness of contemporary art history to writing, even though it also suggests that the resistance to considering historical writing directly or simply “as writing” may be even more entrenched in contemporary art history because it seems to apply mainly to earlier practices. 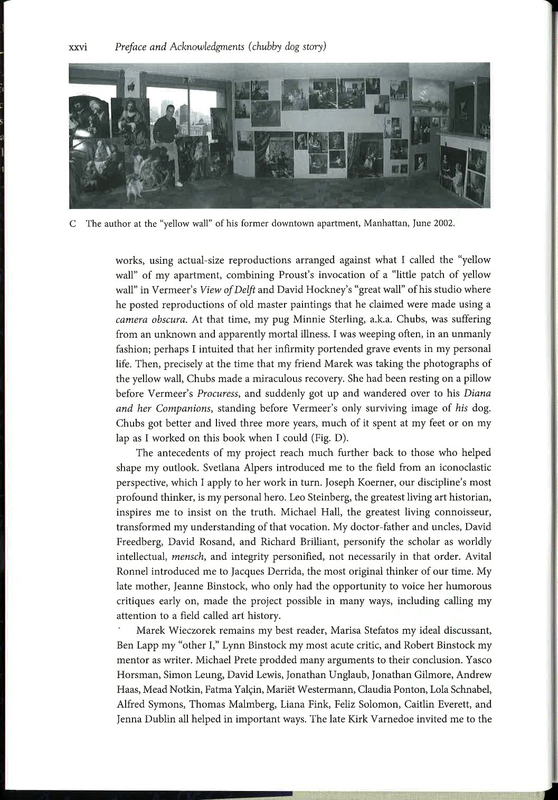 So if I consider Vermeer’s Family Secrets as an example of “creative nonfiction” or the “lyric essay” (that’s John D’Agata’s expression), then I think the book appears primarily as a collage, because it moves restlessly between voices, influences, methods, tones, and kinds of evidence. It combines, or juxtaposes, very disparate methods and kinds of writing, and so it can appear that it finds its voice in particular passages instead of as a whole. Here are three examples. These passages are about as unguarded as anything in recent art history, so they might seem like the book’s strongest moments as writing—the moments when the authorial voice can be heard above the obligations of historical writing. But there are only a few such passages; rhetorically they are apostrophes or condensed encomia, and they aren’t typical of the book as a whole. Second, it can seem that the writing is most effective in those passages that are irreverent about what Binstock takes to be the protocols of art historical publishing. It is striking, embarrassing, and funny that he reproduces a bad flash photograph of his beloved dog (along with a story about how the dog, which was sick, was cured by sitting in front of a reproduction of a Vermeer painting of a dog). But it is even more striking, weird, and discomfiting when he reproduces a painting of a rabbit in a footnote, claiming it is by Renoir, even though that attribution has nothing to do with his larger arguments (p. 362 n. 10). The story about the dog is in line with confessional experiments in art history that have been attempted by many writers since the 1960s, including Linda Nochlin and Griselda Pollock. But the second is a kind of infraction of the idea of the monograph: even in a book that finds space for an entire section on Las Meninas, a footnote on Renoir can seem to be a breach of scholarship. But again, passages like those don’t account for enough of the book to serve as keys to its style or voice. In the end they are jeux d’esprit, rebellious gestures, and if they were cut the book would remain largely intact. Passages like this one don’t last long: Binstock moves rapidly from one rhetorical mode to another, sometimes repeating himself, switching suddenly to optics, to an invocation of a painting within a painting (in the mode of Michael Fried), and then to Lacan, and on to a discussion of mirrors… it’s the temperature of the writing that is distinctively his, rather than the raw materials and methods. When he claims that the man who was once in the background of the Girl Asleep in the Metropolitan Museum of Art (the man was painted out, and revealed by X Rays), whom he identifies with Vermeer’s wife, is “logically her brother Willem,” the reader has to go along, because there is no other available context. But as rhetorically interesting as these passages are, they also don’t occur frequently enough to comprise a voice or tone for the book as a whole. These three examples are to indicate why I think the best way to characterize the writing in Vermeer’s Family Secrets is as a collage, an experimental juxtaposition of what Binstock understands as the full complement of art history’s viable methods and tools. It might even be said that outrageous personal passages and stories about dogs and rabbits are ways of provoking the discipline to write more openly, or even of challenging readers to accept even the large collections of archival and biographical material as integral by comparison with the apostrophes and asides. An interesting contrast here is Leo Bersani and Ulysse Dutoit's similarly titled Caravaggio's Secrets; their methodology is consistently psychoanalytic, so their sense of “secrets” is different and so is their sense of evidence. But the consistent, developed methodology makes their book more uniform, and less experimental. As writing, then, the book is a energetic compressed collection of methods, modes of writing, voices, influences, and tones, and that, I think, is the deeper reason why it has been hard for the discipline to accept. The complaints of art historians—both the ones at the NYU conference, and the ones who stayed away—tended to focus on Binstock’s interest in positivist facts or topics like Vermeer’s family, the dates of the paintings, or the attribution of artworks, places, and dates. But I suspect the discipline’s deeper allergy is to that does not observe the increasingly uniform style of disciplinary art history. For me, the interest of Vermeer's Family Secrets in this context (aside, as usual, from questions of historical truth or use) is that it illuminates the standard practices of art history, showing by contrast that they are more carefully homogeneous than they may appear to those who practice them. I assume the book includes as many illustrations as Binstock and the press could afford. The fact that it has a color insert, instead of color throughout, shows that many decisions will have been made for economic reasons. By comparison Clark’s book is all color. That fact about Vermeer’s Family Secrets marks its peripheral relation to art history as well as any arguments about methodology or writing. With more potential readers, the press would have let Binstock have all color, and possibly also a larger trim size to display his charts of the paintings’ relative sizes. Some arrangements of the images are creative, like the positioning of sets of apparently unrelated images on single pages. But the most unusual feature is a spread of images showing Vermeer’s paintings reproduced at a uniform scale, so that some are tiny on the page. 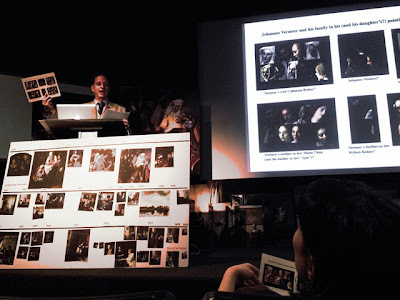 At the NYU conference, Binstock brought in full-size mounted color reproductions of all of Vermeer’s paintings, and filled the stage with them. He also had a magnetic whiteboard with movable images, in case someone wanted to make their own chronology. The book includes an illustration of his apartment in New York with yet another set of full-size reproductions.